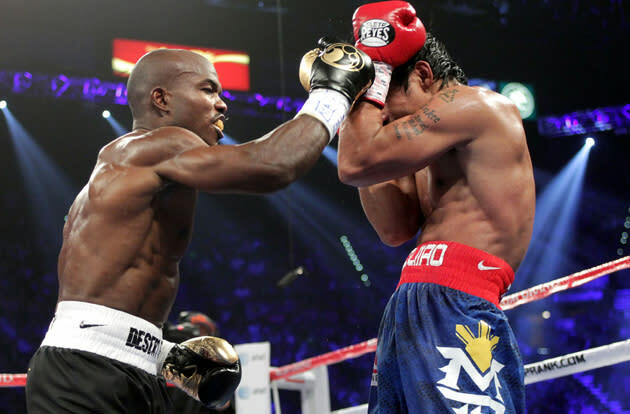 LAS VEGAS — Reporters were typing away in the late stages of the welterweight title fight Saturday between Manny Pacquiao and Timothy Bradley Jr. at the MGM Grand Garden. The fight got a late start, deadline beckoned and so journalists representing newspapers and Internet sites began clattering away on their keyboards as the fight rolled down the home stretch. They mostly were preparing stories that said, essentially, Bradley fought a good, hard, honest fight and Pacquiao won a clear, convincing decision that kept hopes alive for a mega-fight with Floyd Mayweather Jr.
Then, ring announcer Michael Buffer turned the boxing world upside down when he announced that it was Bradley, not Pacquiao, who won a split decision. Jerry Roth favored Pacquiao, seven rounds to five, and had it 115-113. But C.J. Ross and Duane Ford each had it seven rounds to five, 115-113, for Bradley. And prompted the outrage to flow. Timothy Bradley promised to shock, though the biggest shock in his fight with Manny Pacquiao came from the judges' scorecards. In a fight Pacquiao seemed to have in hand, two judges decided otherwise, giving Bradley a split decision Saturday night and ending the Filipino fighter's remarkable seven-year unbeaten run. Columnist Ed Graney of the Las Vegas Review-Journal nearly blew a gasket. When the scores were announced, he was shaking his head and saying, "What? What?" In his column, he questioned the ability of the judges. I don't know why anyone is surprised. It's like waking up on Dec. 25 and wondering where all those presents came from, like a wife reacting with shock that flowers arrive on Feb. 14. Boxing and ridiculous decisions by those who judge it have become more common than the Yankees spending money. It's so old, so predictable, so unbelievably laughable. He later poked fun at Bradley's corner, which believed its man had won the fight. Bradley sung a different tune afterward, saying his corner told him that if he won the final round, he would win the fight. Which, if so, means those advising him were as delusional as those judging the fight. In a stunning slight to punch statistics — and the naked eyes of most everyone else — two Nevada judges Saturday scored that Timothy Bradley upset Manny Pacquiao. 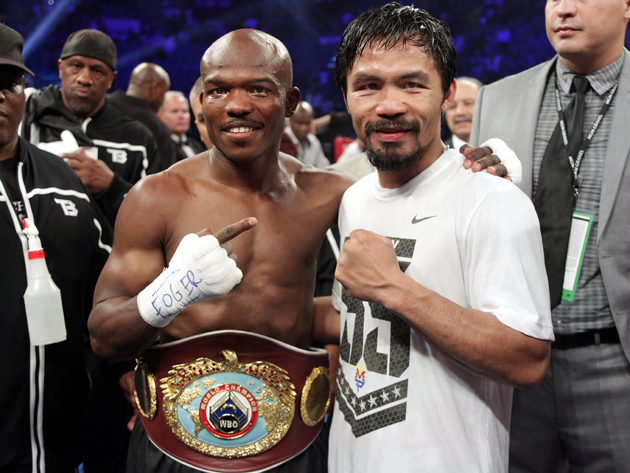 Timothy Bradley had youth and confidence on his side. Manny Pacquiao possesses power and speed in abundance. Pacquiao made good use of his skills to pound Bradley, but he couldn't convince two of the judges at ringside that he did enough in one of the worst decisions in recent boxing history. The Boston Herald's Ron Borges, a Hall of Fame boxing writer if ever there was one, had one of the best takes on the outcome. He, too, had Pacquiao 117-111. A lot of things are legal in Las Vegas that are not legal anywhere else. Last night robbery was among them. After what appeared to most observers to be a lopsided victory for Manny Pacquiao at the MGM Grand Garden Arena, Pacquiao became the victim of not merely petty theft but grand larceny when it was announced he'd lost a split decision to undefeated former junior welterweight champion Timothy Bradley. Frankly, the decision was so outrageous as to defy description. Even the judge who ruled for Pacquiao, Jerry Roth, didn't get it right, scoring it 115-113 for the champion. There were a few who had Bradley. Brian Kenny, who was calling play-by-play, scored it for Bradley, as did San Francisco 49ers running back Timothy Bradley. Dave Cokin, a long-time Las Vegas radio talk show host, sports bettor and boxing observer, scored it a draw, 114-114. 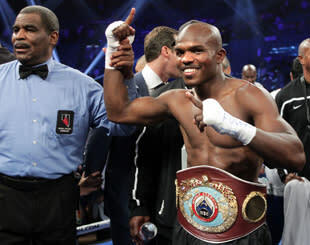 Newly crowned WBO welterweight champion Timothy Bradley showed up at the postfight press conference Saturday night in a wheelchair, saying he thinks he broke one ankle as early as the second round and perhaps sprained the other. Which makes what happened in his title fight against Manny Pacquiao even more unbelievable. In a split decision that stunned most everyone in the arena, even many of his supporters, Bradley defeated Pacquiao to take the belt of the Filipino fighter and congressman and hand him his first loss since 2005.